What is StandOut? 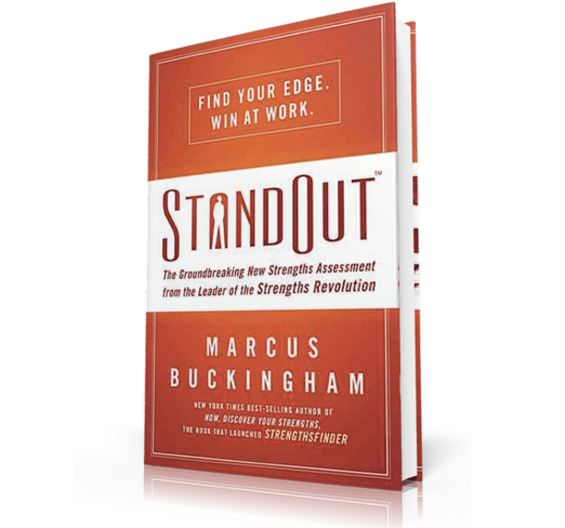 TMBC created an assessment that pin points your lead and secondary strength roles and combined role that is your comparative advantage to StandOut at work. 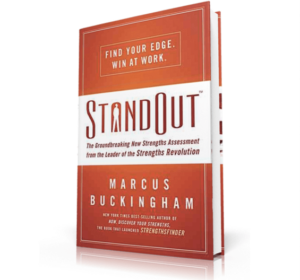 This strengths based assessment is different from the VIA or StrengthsFinder 2.0 in that it measures what we do at work versus who we are at work. Not only does the StandOut report give you the definition of each strength role, how you are most powerful, phrases to describe yourself, how to make an immediate impact, how to take your performance to the next level but what to watch out for with your strength roles. The report will describe your ideal career, how to win as a leader, how to win as a manager, how to win in sales, and how to win in client service. By the way I’d love to show you how to build your leadership brand, write a better resume or about page on your web site, promote yourself in a big interview or discover a new niche from your comparative advantage revealed in your StandOut report. For an example view Brent’s StandOut Report. If you’re eager for strengths application with your VIA, StrengthsFinder 2.0, and StandOut results to grow stronger, work smarter, and live richer in your life and work then download your application for the 2013 – January 14th 7 Week Virtual Strengths Mastermind. Only 7 seats left! Can you feel and see yourself as a passionate strengths advocate? Do you aspire to connect with cutting edge strengths experts? Will you mobilize your strengths serving the world? If that’s you then you’ll love to join my brand new Strengths Ambassador Inner Circle and sign up for my FREE kick-off call interviewing Curt Lievsfeld, Sr. Gallup Consultant, co-author of Living Your Strengths on January 7th 9-10:30 AM (CST). This is a live call and will NOT be recorded. If you enjoyed the blog today please share your comments and forward to your world. https://brentobannon.com/wp-content/uploads/2012/12/How-do-you-stand-out.png 528 565 brent https://brentobannon.com/wp-content/uploads/2017/01/obannonlogochangeweb.png brent2012-12-27 17:48:442016-02-10 20:16:40How Do You Stand Out? What Character Strengths Do You See Around You? What is the VIA Institute? The The VIA® Institute on Character was established as a non-profit organization in 2001. Their mission is to advance both the science and the practice of character. They aim to fill the world with greater virtue by offering the VIA Survey, free of charge, across the globe. The VIA Survey has been taken by over 1.3 million people in 193 countries and 17 languages. What is the VIA model? There are 6 virtues and 24 total character strengths that fall within each virtue category. What are the 24 VIA Character Strengths? https://brentobannon.com/wp-content/uploads/2012/12/what-character-strength-do-you-se-around-you.png 290 565 brent https://brentobannon.com/wp-content/uploads/2017/01/obannonlogochangeweb.png brent2012-12-17 20:40:432016-02-10 20:18:50What Character Strengths Do You See Around You?